3) It is known that John Stride was alive after the disaster - in fact he lived until 1884. I was, therefore, very interested in one section of some Daily News press reports that Stephen sent me for transcription. In a report of 8th October 1888, the Daily News reports that a search was made of Woolwich newspapers for reports into the disaster. The News recounts that details were found which seem to support Stride's story in virtually every detail, even down to the injury to her mouth which, we are told, was inflicted by a retired police inspector! The report is below - make of it what you will. 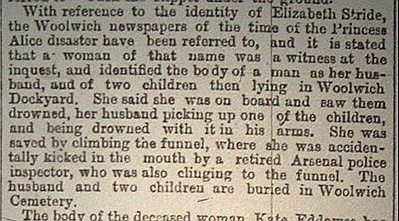 With reference to the identity of Elizabeth Stride, the Woolwich newspapers of the time of the Princess Alice disaster have been referred to, and it is stated that a woman of that name was a witness at the inquest, and identified the body of a man as her husband, and of two children then lying in Woolwich Dockyard. She said she was on board and saw them drowned, her husband picking up one of the children, and being drowned with it in his arms. She was saved by climbing the funnel, where she was accidentally kicked in the mouth by a retired Arsenal police inspector, who was also clinging to the funnel. The husband and two children are buried in Woolwich Cemetery. Do we know what the surname of this man was ? Is it possible that Stride had the bare-faced cheek to claim three unidentified bodies as being her family? Paul Begg said that one is almost convinced that Stride had been masquerading as Mrs Malcolm's sister! Sorry Chris , not the policeman , but the man that Stride claimed was her husband. His name can't have been Stride as there were no people called Stride lost in the disaster. If Liz had left John Stride during this period , she might have taken up with a man who she may well have called her ' husband ' although there was no legal connection because she was still married : the possibilities of a divorce would have been beyond her. Maybe this is a true story of which we don't understand all the details fully. You say there was no one named Stride lost in the disaster. We must not forget that circa 120 people were not identified. "Many of the bodies were unrecognisable after being in the water. In Victorian times, few people carried any form of identification. Many of the bodies were unrecognisable after being in the water. In Victorian times, few people carried any form of identification. Some were identified from their clothes. Despite considerable efforts, around 120 bodies were buried as unidentified." Police Superintendent East India Docks. No age is given for Supt. Aslat - he is simply listed as "adult." A very interesting find, thanks for posting. The simple way to check this out would be to look through the Woolwich local papers, which should be available at Colindale, or perhaps at local libraries in that area. As I live a couple of hundred miles from London, I am unable to do this, but is there anyone out there who could undertake this task? The report does say that the man and the two children are buried in Woolwich cemetery , I wonder if it would be possible to find out who they might be ? Sadly I'm living 140 miles away from London as well , but maybe there is somebody who could help ? It looks as though the inquest records - or at least some of them - may have survived. Unfortunately, I can't get up there for a while. The contents of this catalogue are the copyright of London Metropolitan Archives. Rights in the Access to Archives database are the property of the Crown, � 2001-2004. [from Scope and Content] Records relating to the inquest on the victims of the wreck of the steamship "Princess Alice" in the Thames off Tripcock Point, Plumstead Marshes on 3 September 1878 after collision with the steamship "Bywell Castle"
There was a Walter Ham Aslot age 43 living Lambeth in 1871 census. Ancestry say "Aslot" but it looks like "Aslat" to me. Occupation is "Commercial Dock East India (illegible)". Chris, do you think you could post the image, please? I am attaching the illegible part regarding his occupation. Yes it does look more like "clerk". That may be "China" written above the rest. What on earth was Stride up to? It seems to be the same Aslat , hes the right age and everything. Maybe he had retired from the police before 1871 ? A very mysterious development , maybe Stride was telling a story that had some truth in it ? Maybe she didn't claim from the relief fund because this man she was with who drowned was her lover and not her husband , she didn't want that to be discovered ? I looked at the list of identified survivors and fatalities from the Princess Alice, and the only Hooper listed is Mrs. Eliza Hooper aged 62, who died in the disaster. I have yet to trace a record of the death of William Hooper but he was certainly dead by 1881 as his son Frederick is listed an orphan inmate of a Metropolitan Police institution, specifically Frederick, is listed in 1881, aged 10 as a scholar at the Metropolitan and City Police Orphanage, Wellesley House, Twickenham. I will carry on trying to find his other offspring but for the son of 10 to be in an orphanage suggests that both William and his wife were dead by 1881. All children born in Woolwich. The only account of this shipwreck that I know of is Gavin Thurston's THE GREAT THAMES DISASTER, published in the middle 1960s. The book is very obscure (so is the disaster - it is less written up than the Titanic, the Lusitania, the Morro Castle, the Andrea Doria, even the Empress of Ireland, the General Slocum, the Sultana, the Eastland, or the Wilhelm Gustloff). I saw a copy at the Argosy Book Store in 1990, and looked in the index, but there was no reference to Elizabeth Stride. As I read this thread, a strange idea occured to me. If Long Liz was telling the truth about her survival in that disaster, then she seems to have had to struggle with that retired arsenal police inspector on that funnel. If his family or friends heard her statement, and learned who she was she might have become a marked woman. Given that her murder is part of the double event of the 1888 series, there has always been a question if both she and Eddowes were killed by the Ripper, or by two different killers. Maybe Stride was not really part of the series, but killed that night to be considered part of the series by the actual killer. But it is only just a passing observation. Back in the early 1990's when I was researching many newspapers of 1888, I came across a short piece concerning someone who knew Stride when she was living in Poplar. I wrote down the details at the time but have since lost the full account. I wrote down that it was in the Illustrated Police News for 27th October 1888. And that the piece was about someone called "Mr North, a publican" and that he had come forward at the time of Stride's murder with a PC Daniels because they had both known her when she lived in Poplar High Street. North revealed that he had seen Stride and her husband daily until 1879, and afterwards less frequently. Apparently, at the time of the Princess Alice Disaster, Stride had told North that she was trying to get some money from the Mansion House Fund. North did not believe her husband was one of the victims, and indicates that he had seen her husband after the disaster. I also wrote down that North had said that she was nicknamed "Mother Gum" on account of "a peculiarity of the top lip, which, when she laughed, showed the whole of the upper gum". I totally believe that North knew Liz Stride. When I searched directories for this man I found a Francis North, of the "Blackney's Head" pub at 143 Poplar High Street, for the time Liz and John lived in that street first at 178 and then 172. Their less frequent visits to his pub after 1879 can be explained by them moving to Usher Road, Bromley, where they appear on the 1881 census. I think that Liz simply tried to take advantage of the Princess Alice disaster to gain money as she may have done at other times in her life? And because there was a peculiarity to do with her mouth, she probably attempted to turn this also into a story of an injury gained while bravely fighting for her life in the disaster. Despite the fact that the people who she knew in Poplar used it to ridicule her as "Mother Gum". Just to add someting slightly related, I was surprised to see that the Princess Alice name plaque from the side of the boat still exists and is on show at the Docklands Museum in Canary Wharf, London! It was probably called the Blakeney's Head. I just copied the name of the pub as Blackney's Head because the post office directory called it that, but there are a lot mistakes in directories. "Retired Arsenal police inspector"? How did she know? If retired, he was not in uniform; presumably they weren't chatting about autobiographical details while struggling for a good grip on the funnel. The only explanation I see plausible would be if they had gotten into conversation before the accident. But this seems to have the slightly too complete details of of a false account. Does anyone have pictures of the hapless ship, funnels and all? Chris: very interesting. If you're not already aware of this, "Arsenal" at that time would have referred to the Woolwich Arsenal, not the current home of the eponymous football team. If my memory serves me correctly, the East India Docks are in that general vicinity.